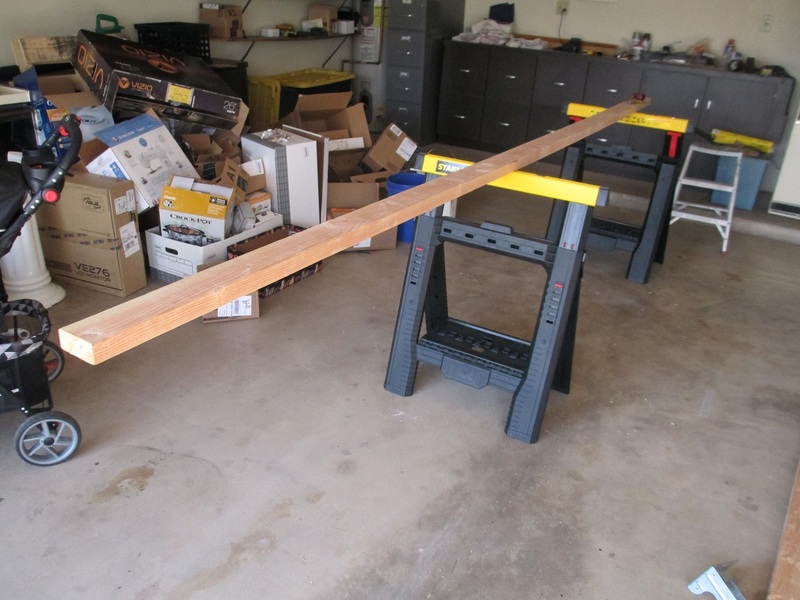 This post will be the second entry in a series detailing a weekend project I recently engaged in, which was the construction from scratch of some garage shelving. Furthermore, I expect that this series will be the first of many woodworking projects that I detail on this blog. Why, you may ask, am I writing about carpentry on a blog that has, up until now, been focused on computers and web development? I see this blog as focused on engineering, and woodworking is certainly a type of engineering! Furthermore, I think that there is a niche for amateur woodworking tutorials and I intend to fill that. These posts will be written for the use of amateurs, including those who have zero experience in working with wood. I will be writing the most basic of techniques, including how to create and adapt plans, how to properly measure and cut wood, and the like. This is the kind of post I would have found useful when I was starting out, and it is my hope that it will be of use to others, too. Note that I am far from an expert myself, so I will be glad for any feedback that those more experienced can provide me. Show you the general processes involved in building a project out of wood – creating the plan, finding and sizing the materials, and assembling the item. 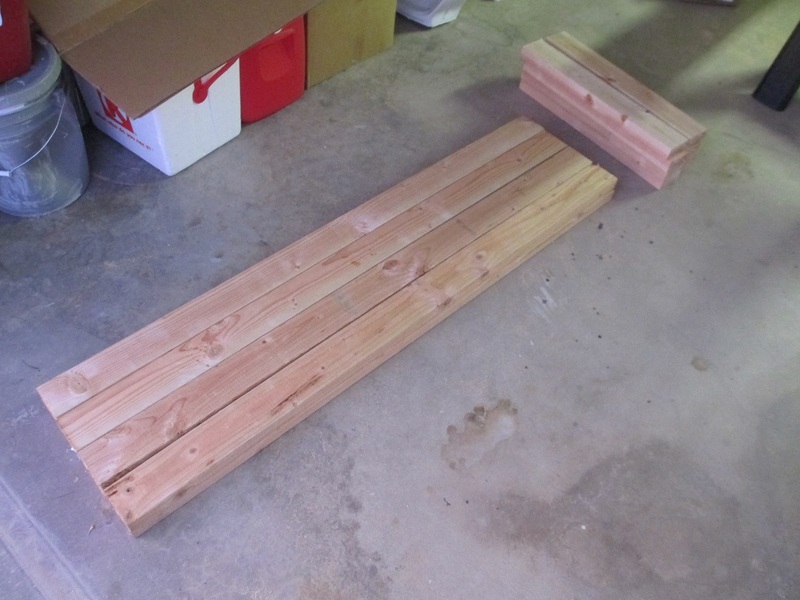 In Part 2 – Cutting the Wood, I am going to focus on cutting the materials that we purchased in Part 1 down to size. For experienced woodworkers, this isn’t difficult – but there’s a lot that goes into it that amateurs may not know about. We’ll mainly be discussing the concept of kerf, and how to maintain a straight cut. 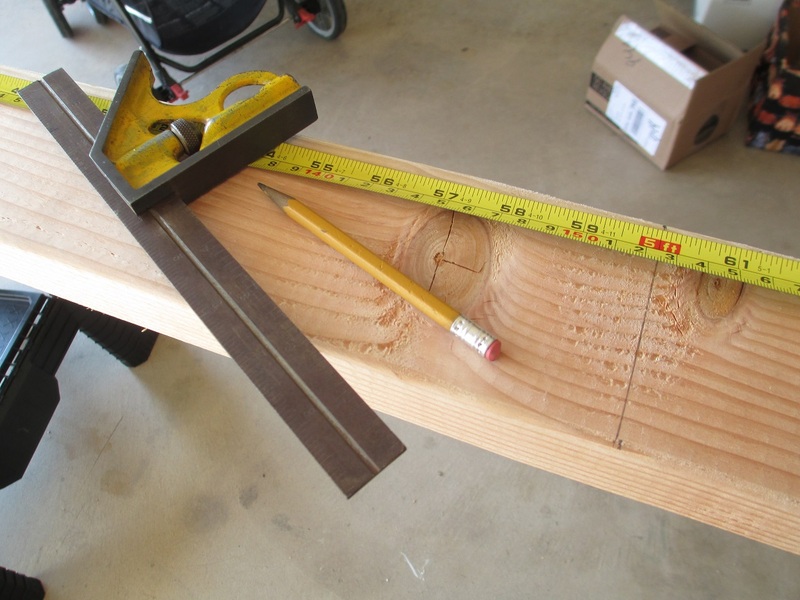 Because I have not yet purchased a power saw for my shop, I’ll be using a handsaw, but most of what we’ll be discussing will be applicable no matter what tool you’re using. When we left off in Part 1, we had purchased our materials – eight 12’ lengths of 2x4. As you can see, we’ll need to make 16 cuts overall. They are all simple perpendicular crosscuts, but even these simple cuts have a lot to consider. Ensuring that the cut will produce a piece of the right length. Even in a relatively rough project like a garage shelving unit, we don’t have much margin of error. 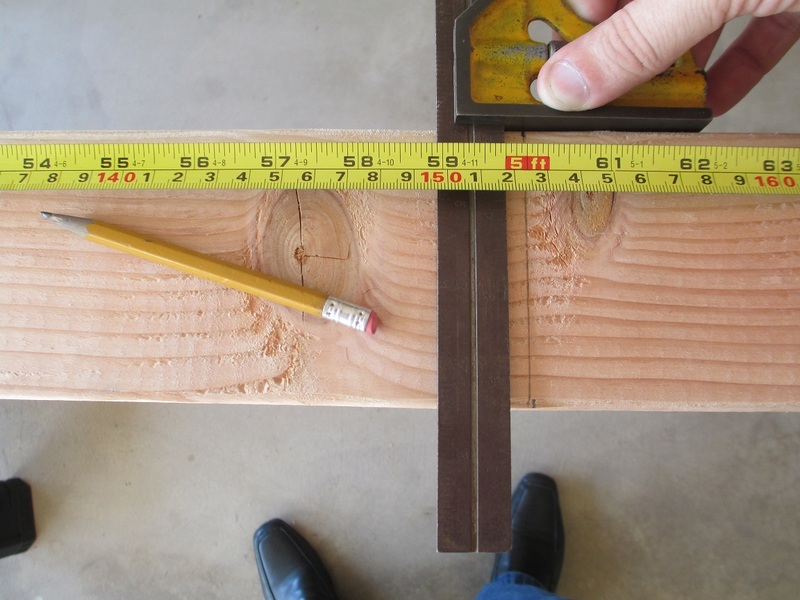 A difference in the lengths of the posts of 1/16” will affect how level the shelf is, for example. We need to make sure that each cut we make produces a final result that is exactly as long as we want it. Ensuring that the cut is straight and produces an end that is exactly perpendicular (90 degrees) in both dimensions. Again, because with this unit our margin of error is more relaxed than it would be in fine cabinetmaking; but a curve in our cut can still harm the final product, as it will make certain joins more difficult. Safety – both your own, and the lumber. A handsaw is less dangerous than a power saw, but it is still a sharp tool, and it is possible to hurt yourself if you’re not careful. 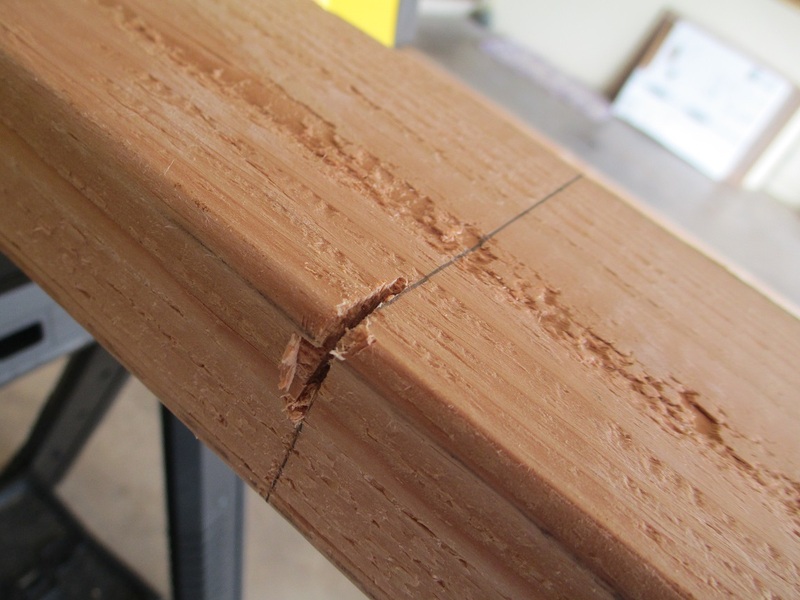 Aside from keeping your own self safe, you also want to protect the lumber – cut it in such a way that when the cut is complete, the lumber won’t fall in such a way as to damage it or anything around it. We will now walk step-by-step through the process of making a cut, and discuss at each step how we are working towards those three concerns. The sawhorses also allow me to make the cut in a way that is safe for both me and the lumber. I am right handed, so I will be holding the saw in my right hand while making the cut, and holding the lumber in my left hand. 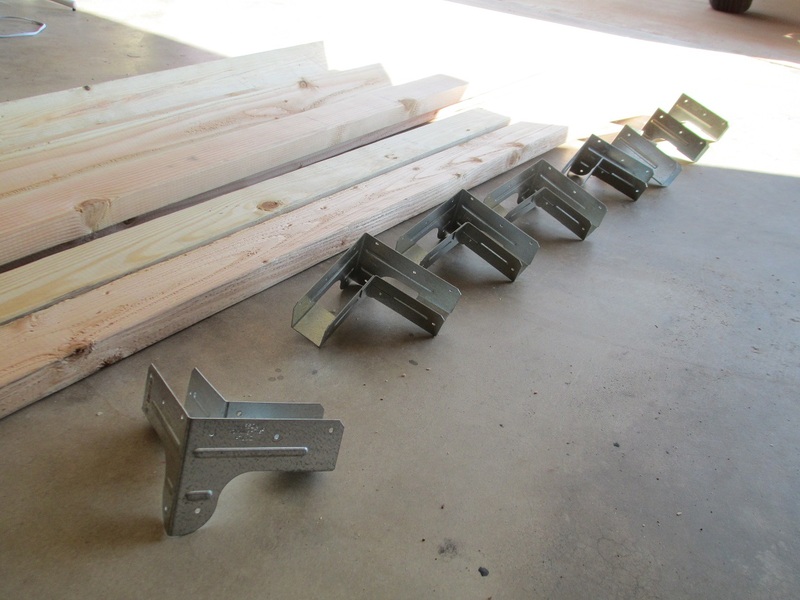 This provides three points of support on the stud – two from the sawhorses, and one from where I am holding it. This is a comfortable way for me to make the cut. 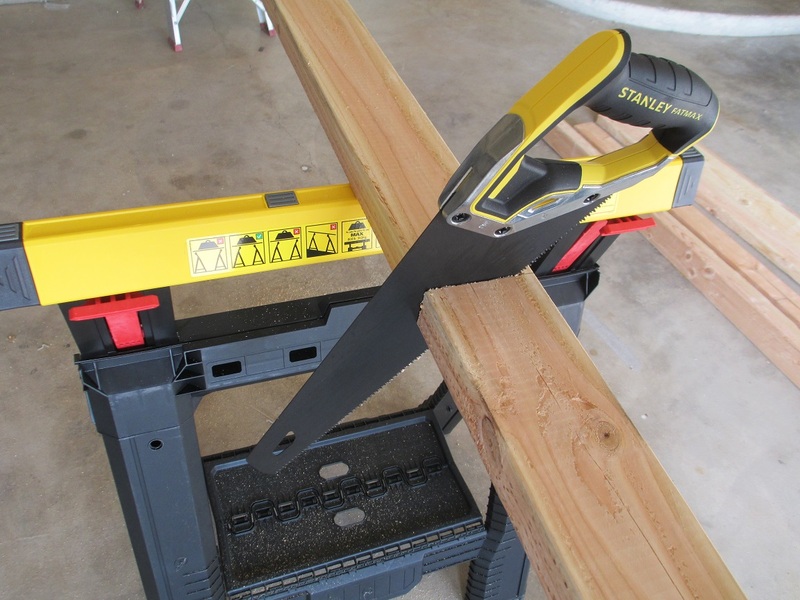 It also prevents either piece of wood from falling after the cut is complete – I will be able to keep hold of the cut piece with my left hand and prevent it from falling (and possibly cracking or splitting), while the sawhorses will continue to support the remainder. Ideally, you should make all cuts in this manner if possible. Now that our lumber is on our sawhorses, we can draw our cutline, which we will use to guide our saw. We will need two tools to do this: a tape measure, and a square. Use your square to draw a line between the two marks. The square ensures that the line you draw will be perpendicular to the edge. Draw your line so that it runs exactly between your marks. If the marks still don’t line up, it’s possible that the board end you’re measuring from is not square. If this happens, you’ll have to improvise – one possible solution is to try to eyeball a “middle” between your marks. Once again, for this project, you do have a small margin of error, so don’t worry too much if you can’t get your marks perfect. All right, we have our guidelines – now it’s time to make the cut. Now that we’re ready to make the cut, it’s time to introduce a very important concept: kerf. Kerf refers to the amount of material you remove from the wood when you make a cut. Kerf is important, because if you’re not careful when making the cut, your kerf can remove material that you did not intend to remove. When we made our guideline, we made it such that the lumber to the left of the line is lumber we want. It may be tempting to make the cut such that the saw blade is in the middle of the guideline. However, if we do this, then half our kerf will consist of material we didn’t want to remove. When setting up your saw for the cut, I like to start at the corner where my two guidelines meet, and begin there. This allows me to follow the two lines in both dimensions at the same time, and ensure my blade stays straight. Take it slow and blow the sawdust away as it accumulates so you can see the guidelines at all times. It may feel like you don’t have to pay attention to the guidelines once you’ve got the cut started, but this is not so – keep your attention on the straightness of your cut at all times. Finally, keep your fingers away from the sawblade when cutting! If your cut went well and is straight and perpendicular, congrats! If not, don’t feel too bad. Cutting wood is an art and you get better with practice – and with 16 cuts in this project you’ll get a decent amount of practice. So you’ve made your first cut. 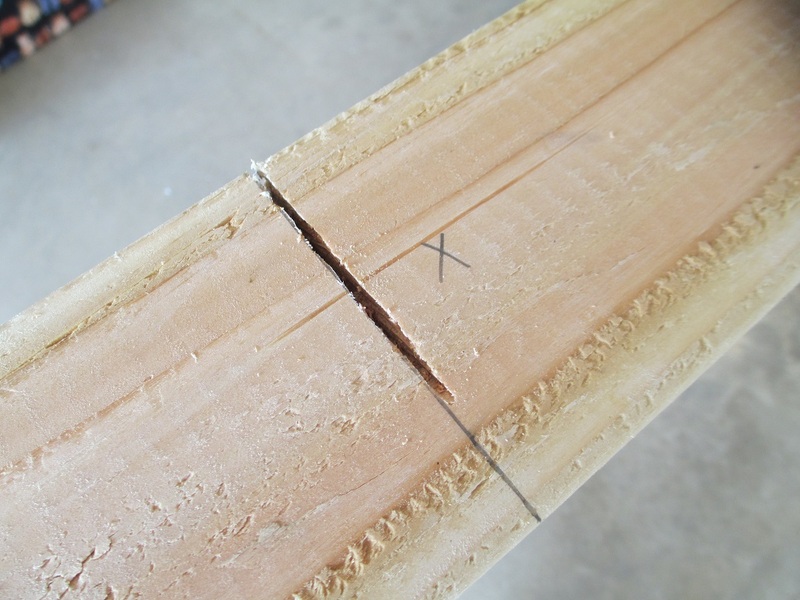 Put your cut piece off to the side – now you have the remainder of the wood, which now has a cut end and a non-cut end. It should be easy to tell which is which if you forget – the cut end will have much rougher edges than the non-cut end. The first photo is the cut end, the second is the non-cut end. See the difference? Assuming you’re going to cut another piece off your remainder, head back up to Step 1 and start the process again. That includes measuring! 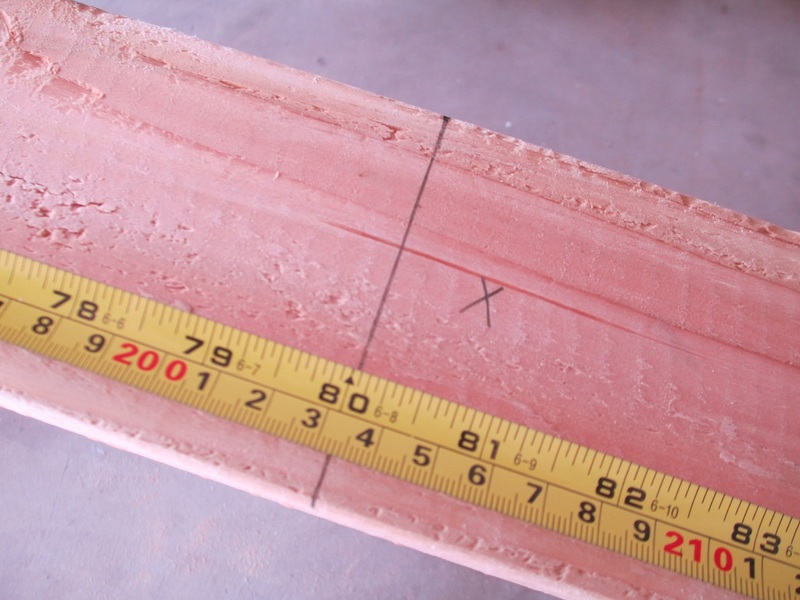 When I first started I liked to measure all my cuts first and then make them – however, I’ve since found it easier to re-measure after each cut, so that my measurements take into account the kerf. Ready to attach the brackets! That will be the subject of our next post, so stay tuned.